A few questions to Noel Alpins, Australian cataract and refractive surgeon, who is one of the most renowned expert and has deeply studied the technological aspects related to the planning of surgical procedures for astigmatism correction and its postoperative outcomes. Fig. 1. 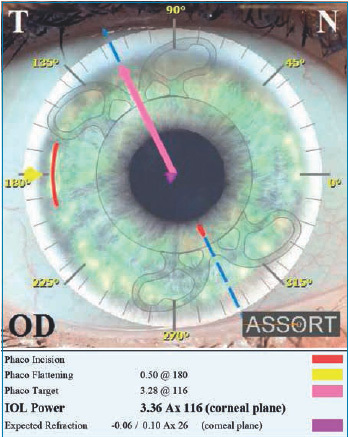 SIFI ASSORT Toric IOL Calculator displaying the effect of the phaco incision placed temporally at 180 degrees on the preoperative corneal astigmatism. He has invented new methods for treating and analyzing astigmatism, and has developed the ASSORT surgical planning outcomes analysis software program that is used by ophthalmologists in Australia and overseas. You have developed a widely used IOL power calculator, could you please explain its main advantages? The ASSORT® software I developed is based on the Alpins Method of planning and astigmatism analysis used in refractive, corneal and cataract surgery. The Alpins Method forms the basis for astigmatism analysis methodology published by the American National Standards Institute and is the standard adopted by the Journals of Refractive Surgery and Ophthalmology by AAO for analyzing and reporting astigmatism results. The ASSORT® toric calculator is considered the most precise and performing IOL power calculator, thanks to its powerful algorithm based on vector analytic approach to astigmatism analysis. The ASSORT® toric IOL calculator includes “Pre-operative planning” as well as ‘Refractive surprise analysis’ module, to manage unexpected post-op refractive outcomes. The Assort calculator is now available in a customized version, could you tell us something more about this news? This is the outcome of a new partnership with the Italian company SIFI and will be another important opportunity to extend the use of the Alpins Method for planning of toric IOLs and astigmatism analysis. The SIFI ASSORT Toric IOL Calculator is now available for the Mini Toric Ready SIFI IOL at www.minitoriccalculator.com. This new IOL of MINI line was specifically developed for the surgical treatment of astigmatism in cataract surgery. Fig. 2. 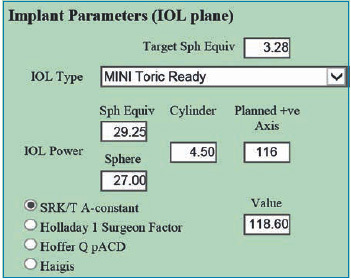 Spherical and toric IOL parameters for Mini Toric Ready SIFI. Why is the position of the incision so important for toric IOLs power calculation? The position of the phaco incision for toric IOLs is of paramount importance. Any effect it has on the preoperative corneal astigmatism must be factored into the toric IOL selection process, as well as its placement. The surgeon must calculate the effect of the incision on the preoperative corneal astigmatism – both for change in magnitude and/or any change in meridian. The selection of the toricity for the IOL will then be more accurate. It is important to note that placing the phaco incision on the steep meridian of the preoperative astigmatism will have the maximum flattening effect. Placing the incision away from the steep corneal meridian will cause less of a reduction effect together with rotation of the preoperative corneal astigmatism. As it approaches 90 degrees away from the steep meridian, so the astigmatism increases and less rotation occurs. Why is it better to refer to the Flattening Effect of the primary incision instead of the whole SIA (Surgically induced astigmatism vector) for IOL power calculation? The SIA is composed of both the Flattening Effect (FE) and the Torque. The FE is the amount that has acted on reducing the magnitude of the preoperative corneal astigmatism and the Torque is the component involved in rotating the astigmatism from its preoperative meridian to its postoperative meridian, but not reducing it. Fig. 3. SIFI ASSORT Toric IOL Calculator displays the calculated IOL power at the corneal plane and the expected refraction. Using the whole SIA over estimates the effect of the incision in reducing astigmatism and leads to an inaccurate calculation of the corneal astigmatism or positioning of it; consequently and inaccurate calculation of the toricity of the IOL required to neutralize the corneal astigmatism. In your opinion the latest technological innovation can really improve the management of the “refractive surprise” in the post-op of astigmatism cataract refractive surgery? Rotation of the implanted toric IOL – using the Assort toric IOL calculator (www.assort.com) the minimum amount of refractive cylinder that can be achieved by rotating the toric IOL is calculated – if this reduces the refractive cylinder surprise significantly to below 1.0D, then it is just a matter of rotating the implanted toric IOL to the calculated axis. Ideally this should be done 4-6 weeks post cataract surgery. Replacement of the implanted toric IOL – again using the Assort toric IOL calculator, analysis using the Alpins Method displays the Magnitude of Error (ME) which is the difference in magnitude between the Target induced astigmatism vector (TIA) and the Surgically induced astigmatism vector (SIA) and informs us about whether the toric IOL implanted is too strong or too weak for the astigmatism correction. If this is significant (0.75 D or greater) then exchange of the toric IOL with an adjusted toricity or the use of a supplementary lens in the ciliary sulcus is recommended. Excimer laser surgery – if rotation of the toric IOL implanted does not significantly reduce the refractive cylinder surprise and the ME is less than +/- 0.75 D, then refractive laser surgery is recommended to correct the remaining astigmatism from what is likely multiple causes. Finally, are there great differences in the approach to astigmatism treatment in Europe and in Australia? The approach to astigmatism in Europe and Australia is very similar- we both have the advantage of the latest technology available which includes the latest design IOLs, surgical and diagnostic devices. When there are no signs of lenticular opacities and patient is suitable for refractive laser surgery I use vector planning to optimally treat astigmatism. In many cases where ocular residual astigmatism (ORA) exists due to the corneo-refractive differences, vector planning reduces the amount of corneal astigmatism remaining postoperatively compared to treatment by refractive parameters alone without increasing the refractive cylinder remaining postoperatively. Vector planning incorporates both refractive cylinder and corneal astigmatism into the treatment plan by using an optimized approach with both corneal and refractive cylinder parameters taken care of.